Representing buyers and sellers valley wide for over 20 years. Access to proprietary tools and data analysis via our MLS and mapping technologies. Access to listings, short sales and foreclosures before they are available to the general public. Work with the industry’s best when it comes to: property identification, short sale negotiations, contract negotiations, investment property analysis, just to name a few. Unparalleled exposure on all major search engines including: Google, Yahoo, MSN, Bing and Ask. Over 100,000 visitors in 2018 and 10 websites and social media directing potential buyers to your listing. Customized internet and print marketing campaigns that are second to none in our industry. Enhanced agreements with providers like: Google, Frontdoor, Zillow, Trulia, Movoto, Homes.com, Yahoo and Realtor.com to help drive qualified buyers to your listing. If you are relocating to another area you can work directly with one of our team members on the Berkshire Hathaway HomeServices Relocation Network to assist with all of your relocation needs. Berkshire Hathaway HomeServices – 30 Companies in 25 States, Over 1000 Nationwide Offices, 199,356 Closed Units 2017, 35,000 Sales Executives, and $67 Billion in Sales Volume. Complete commercial as well as residential representation. Servicing all of Arizona, in addition to corporate and personal relocation services nationwide. Proprietary network of exclusive top rated service providers and associated vendors. 6 full time licensed team members to assist you personally with all of your real estate needs. 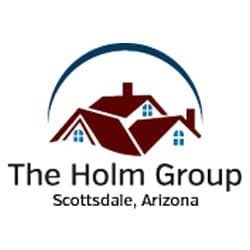 The Holm Group offers EXCLUSIVE online search tools to help you “see” the Valley of the sun like never before. Our state of the art mapping and MLS real estate technologies, as well as our dedicated buyer’s agents will assist you in finding the right property faster than ever before. Take the first step and register or call The Holm Group today 480-206-4265.